Acrobat wines are grown responsibly in the gorgeous hills and valleys of Western Oregon, producing versatile Pinot Gris and Pinot Noirs that work wonderfully with food of all kinds and are equally satisfying on their own. Tell the stories behind the wine: the people, vineyards, winemaking philosophy, and accolades, encouraging visitors to want to learn more and taste. Express Acrobat as intelligent, approachable, modern, light, and clean. A casual and valuable piece of comfortable daily living. Convey this top tier brand’s professionalism in order to reinforce perceptions of quality and value. Prominently highlight scores. Appeal to a diverse audience who are affluent, mostly female, 21-55, and include emerging and established wine drinking demographics. Acrobatwine.com is the second project I have been fortunate to work with Vin on. Jon and team are pros and are easy to work with. What I like best about working with Vin is that they take their time to understand your direction and over-deliver on a mutually vetted vision. Everything that Vin does is top-notch, clean and beautiful. They understand the mood of fine wine and don’t need to be told what the industry expects. 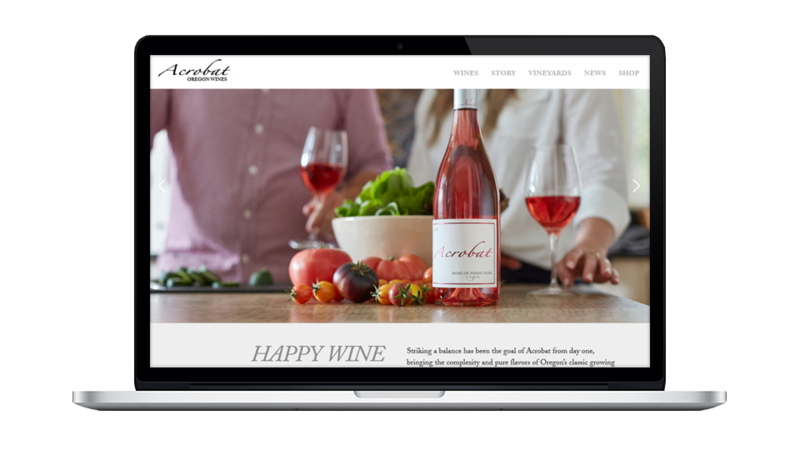 Now that Acrobatwine.com is fully in control of our marketing department, Jon has left us with seamless site that we can easily edit. A+ stuff.